There are times during the summer when I have more ripe fruit available than I can eat. When your kitchen is overflowing with ripe fruit, you can bake as much of it as you can, freeze some and turn some into preserves. I have friends who make outstanding jams and jellies, filling up pantries with huge batches of delicious preserves. I tend to make preserves in smaller batches and then eat them up within a week or two. 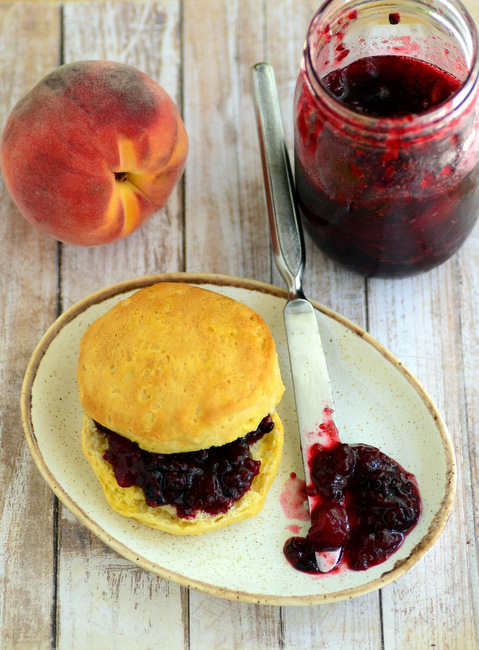 This Quick Blackberry Peach Jam is a easy recipe that takes full advantage of ripe, summer fruits to make a small batch of delicious jam – and that is exactly my kind of jam. You’ll need about 3 large peaches and 1 1/2 cups of blackberries. 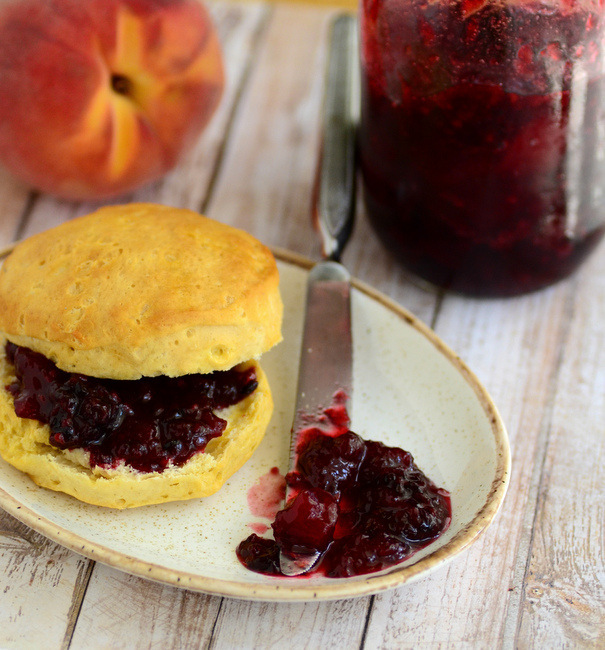 I use more peach than blackberry because blackberries have such a dominant flavor that I wanted to ensure you could still taste the peaches. The peaches should be peeled and cut into large chunks, while the blackberries can go into the pot whole. The fruit is gently mashed while it is cooking to release the juices and break up the large pieces. The only other ingredients are sugar and a bit of lemon juice. You can adjust the amount of sugar to suit your tastes, but this jam is not overly sweet and the flavor of the fruit really comes through beautifully. This recipe is a type of refrigerator jam, which simply means that it thickens up in the refrigerator after cooking. There are only about 20 minutes of cooking time before the jam is ready to go into jars – and not all of that is active time. Speaking of jars, one mason jar is all you need because this recipe makes about 1 1/2 – 2 cups of jam. You can divide it into smaller jars, if you prefer, but you don’t need to worry about filling jar after jar. After pouring the hot jam into the jar (be careful!! ), simply refrigerate for a few hours until the jam has thickened, then go ahead and serve it. This jam will last for 1-2 weeks in the refrigerator. Since it is a relatively small batch, it should get you through a generous amount of peanut butter sandwiches or a couple of brunches with friends and family. It is delicious on biscuits, scones, toast and on top of yougurt. Peel peaches and remove pits, then cut fruit into large chunks. Place fruit in a medium saucepan with 3-4 tbsp of water. Cook over medium heat, smashing the fruit with a potato masher to break it into smaller pieces, for about 10 minutes, or until fruit is very tender. Add in sugar and lemon juice and cook, stirring regularly to prevent jam from sticking, for 10 minutes, or until the jam has started to thicken and resemble a nice sauce. Jam should “coat the back of a spoon/spatula” nicely when ready. Transfer to a mason jar and screw on a lid. Place in the refrigerator and chill for at least 6 hours, or overnight, until jam has thickened before serving.